Enjoy the peacefulness of our secluded resort nestled on a peninsula of Big Mantrap Lake. Enjoy fishing for panfish, bass, northern, and muskies or just go out for a ride and see Nesting Eagles, Osprey and numerous Loons. 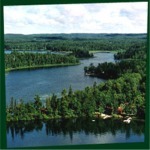 Mantrap lake is 1770 acres with many arms, bays and pine-studded islands. The resort has 5 housekeeping cabins with fireplaces, all located close to the water and a large lodge/game room which overlooks the swimming area. The grounds are level and includes a communal bon fire pit, shuffleboard and plenty of lawn for Croquet or Bocce ball games. Each cabin has a charcoal grill and picnic table.